When I signed up for the Canadian stop of The North Face Endurance Challenge a few months back, I was aware that for a new trail runner, this might be a big challenge for a first 50 miler. I’ve skied down Blue Mountain in Collingwood, Ontario, but running up it had never crossed my mind. That’s what the chair lift was for. I realize this isn’t a big mountain compared to some other ultra marathons, but it does qualify as the biggest elevation change trail race in Ontario. Training in Toronto I have access to some tiny hills in High Park (sort of our version of Central Park), so I started to incorporate that into my training the last couple of months. But climbing up and down the mountain on race day was still going to be new territory. After scouting some different hydration vests leading up to race day, I ultimately decided that I could go without in this race. The longest stretch between aid stations was about 5 miles, and the website gave a very detailed description of what would be on offer. There would be plenty of plant based food options for me including bananas, oranges, potatoes with salt, PB and J, chips, pretzels, gels and electrolyte drink. 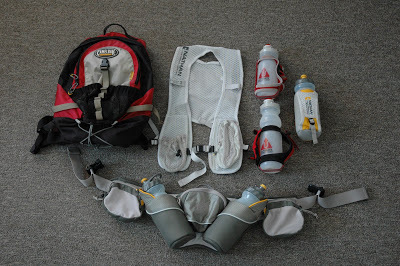 I went with a waist pack with one water bottle and put an extra handheld in my drop bag. I wanted my hands free for the power hiking involved going up the mountain. We camped at the Provincial Park that was an 8 minute drive to the start line. The 50 mile distance has a 14 hour cutoff. I wasn’t sure what all that climbing would do to my pace, but I knew the cutoff might come into play for me at some point. 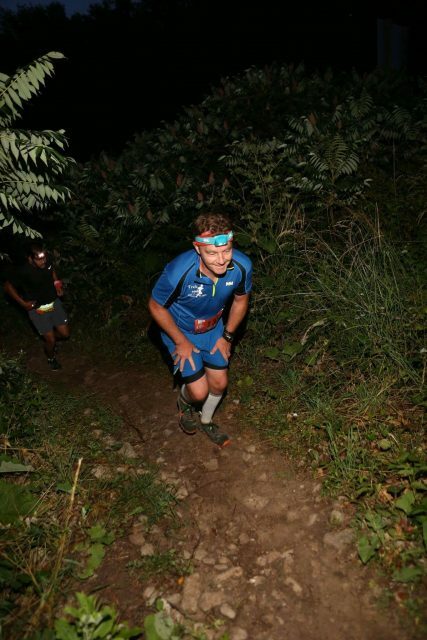 After a short, rousing speech from Dean Karnazes, we were off to climb up the mountain for the first time at 5am. Unsurprisingly, I went out too fast. Even with hiking all the steep climbs, my heart rate was well above where I wanted it for the first few miles. Once that first big climb was done, I felt pretty good. They let us check our headlamps at the first aid station, I grabbed some gels for the road and drank some Tailwind that was on offer. 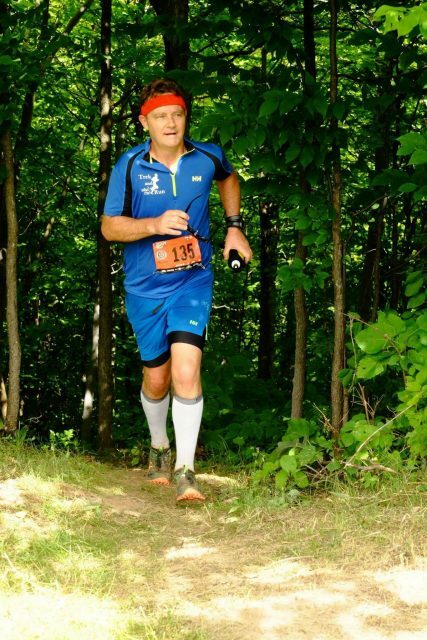 The course is beautiful and varies from grassy ski hills to very gorgeous but often technical trails through the woods to the occasional gravel roads. And once you get up top, with the sun rising, the views of Georgian Bay are nothing short of spectacular. The first half of the race pretty much went exactly according to plan. My goal was to finish under the cutoff, period…but in my head I was thinking doing the first half at a 12 hour pace made sense. Just before that halfway point you go down a long steep ski hill. Very long. At this point there were marathon relay runners on the course (4 runners to a team), so it was probably a bad sign that I was bombing that downhill at the same pace as the relay runners. I try not to brake too much on downhills, but this ended up being like a ride you couldn’t get off. When I got to the bottom, I knew it had taken a lot out of me. I crossed the mat at 25 miles in 6 hours and 9 minutes. Perfect, I have a lot of buffer time in case I really slow down on the second half…and slow down I did! Right away. The course is two 25 mile loops, so the second half starts with the same climb we had done in the dark at 5am. I was climbing so slow it was ridiculous. After a mile or so, I realized that this was the wall. This was a serious bonk. This was the mother of all bonks. I’d never experienced it to this degree before. 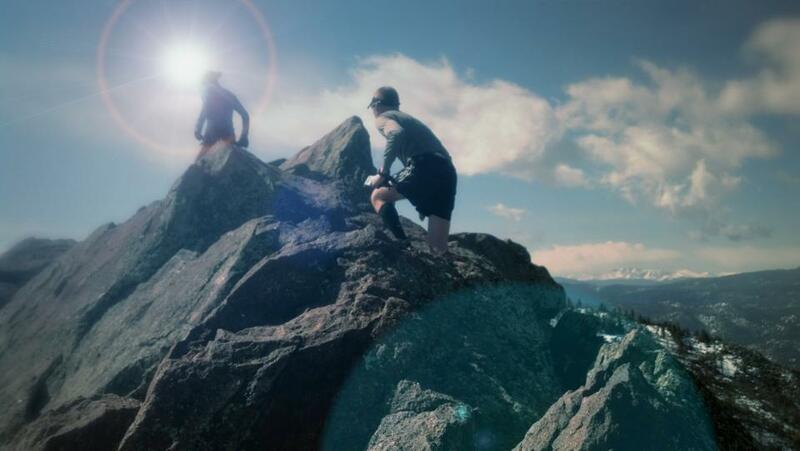 I hoped when the climb was done I’d recover and make up some of the lost time. Not a chance. I could barely even muster the ultra shuffle once up on the mountain. I was walking a lot, and watching my extra time melt away. Someone passed me at the aid station at the top, and I was already worrying about making the third to last aid station at 4:20pm, which was a hard cutoff. If you don’t get there by then, you get a ride back down to the finish line. The aid station volunteers could tell I was hurting. As I finally made my way back out, one of them told me “enjoy it, you’ve trained for this day”. Even though I was mostly only able to walk, I realized he was right. I was alone, walking through the woods. It was beautiful, the weather was perfect. Maybe my first 50 mile run would have to wait for another day, but I resolved to get at least 50km in, and if I was behind the cutoff, then I’d take that ride back down and wait on my teammates to finish. While my body was telling me it had had enough, my mind was experiencing a weird level on mental clarity and even a bit of a high. A lot of things I’d been struggling with in my life lately suddenly seemed way less daunting. I couldn’t believe how I could feel so bad and so good at the same time. You come through an aid station called Cruiser four times along the way. I was doing the math in my head and realized Cruiser would put me at 52km, and my drop bag was also there. So with all the time lost after mile 26, that would likely be where my race would end. When I walked it into Cruiser, I asked about the cutoff. They get on the radio and ask if the sweeper has been though yet. I get word back, “the cutoff here is 2pm, it’s only 1:50”. Ten minutes ahead of cutoff, and moving at probably 12 minutes per kilometer. I knew I was doomed, but told them I’ll go to the next aid station anyway. I get an enthusiastic high five from a volunteer for that decision, drink some coke and head back out there, as I here the volunteer radio “runner 135 leaving Cruiser now”, it dawns on me I’m probably the last runner in the 50 mile race. He tells me he needs to run with me for a bit so I don’t miss a turn ahead where they put tape up thinking all the runners had come through already. He had been up ahead with another runner, not realizing I was still going. 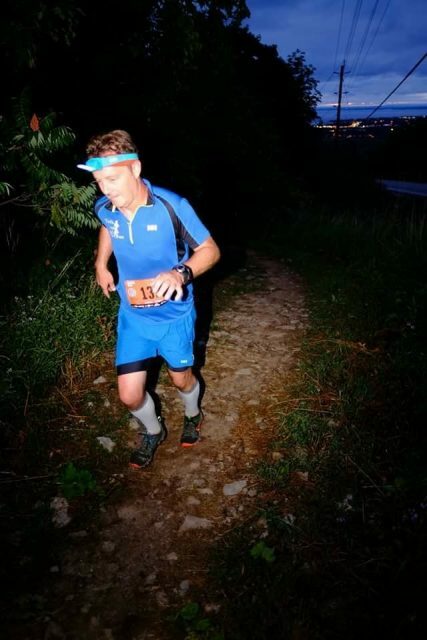 Tim and I chat about ultra running, about the race we had both done in a heat wave a couple months earlier, his recent experience racing Lavaredo in Italy. Then Tim tells me I’m moving well. He thinks I can make the 4:20pm cutoff, and maybe even catch the guy up ahead. For the first time since mile 26 or so, I start thinking that maybe I actually can finish under the cutoff. Tim basically becomes my pacer. The time files by and we start up the hill with the aid station with the hard 4:20 cutoff in sight, and it’s not quite 4pm. “Oh look, there’s the guy I said you’d catch at the top of the hill.” This aid station is the end of Tim’s shift. I thank him and tell him I would never have gotten here without him coming along when he did. Only 9 or 10 miles to go now, I’m pretty sure I’m going to finish this thing. I catch up to the runner ahead, Adam. We chat, he was surprised to see someone was behind him. He’s hurting but grinding it out. I tell him I’m going to pick up the pace a little. He tries to stay with me but has to slow back down to a walk. See you at the finish, before 7pm! 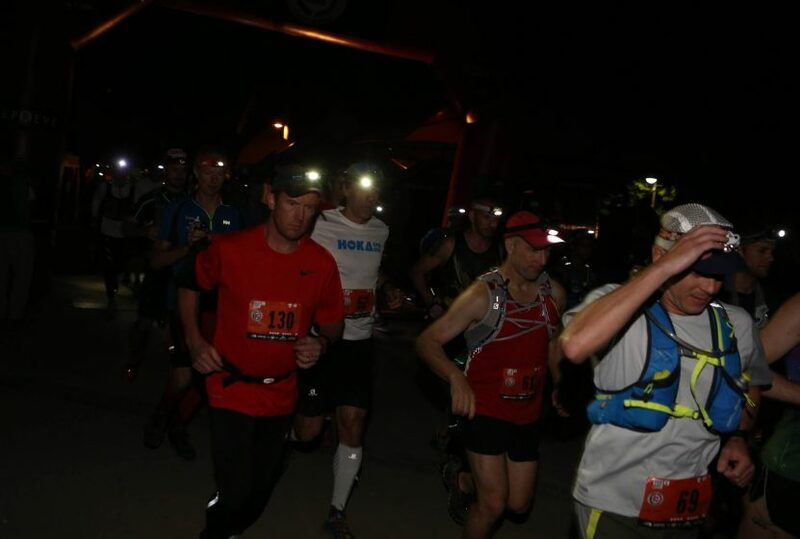 Only a couple of aid stations left, and at the next one I let them know there is one more runner on course behind me. I take the chance to use the porta-potty, and when I come out they tell me the other guy just went through, hurry! I’m not feeling overly competitive at this point, but I guess the race for last is on. I quickly catch up to Adam and his buddy who was pacing him. He doesn’t look thrilled to see me again so soon. 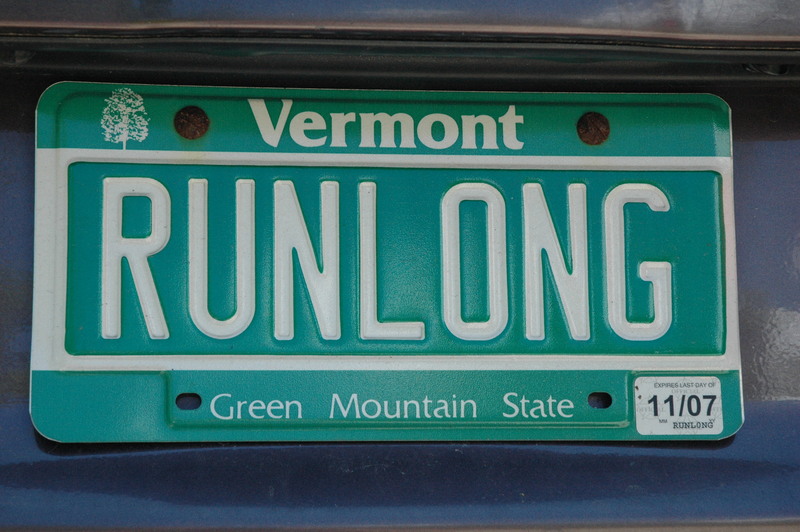 We all chat a bit, and I make a joke about not missing any turns now, like Jim Walmsley did at Western States. I run on ahead of them, less than 5 miles to go…and I miss a turn! Suddenly all the arrows are pointing in the wrong direction. I guess that means I have to climb back up that little steep hill I just came down. Now I’m just laughing because OF COURSE I commented about not missing a turn and then did just that. I’m lost and the thought of just going straight down the ski hill to the bottom with a good story and an almost finish enters my mind. Then I see the trail with arrows going the right way! Now I’m flying thinking I wasted some time, and might be chasing Adam, again. I feel like I’m moving great, I run it back into Cruiser for the last time. They seem surprised to see me. I ask if another runner had come through recently. Not lately, no. I check my last working watch and I have more than half an hour to cover the last 1.4 km to the finish…all downhill. I take that brutal downhill much easier this time around, and come across the finish with 28 minutes to spare. I’m not sure it would have been possible to cut it any closer at the 32 mile mark than I did, but it all worked out in the end. My friends were surprised to see me, since the race projection had me finishing at 8pm at one point, and it was only 6:30. As promised I was waiting at the finish to cheer on Adam, who came in with 5 or 10 minutes to spare as well. It was a day later when I realized that my mega bonk came shortly after running the marathon distance, up and down a mountain. It had never occurred to me at the time. But after those 26 miles, the physical and emotional ups and downs were crazy. It was funny that trying to will myself to run didn’t do anything. Using all the usual motivational platitudes were having zero effect. Hell, Tony Robbins could have been my pacer at that point and I’m sure it wouldn’t have made me go any faster. It was only when I had given up the ghost and decided I couldn’t finish under the cutoff, and realized I was okay with that, that my body gave me some signs that I could pick it up again. I stopped worrying about finishing, stopped watching the clock and counting the splits. And all of a sudden I’m running well again. Go figure. I guess there is a Zen-like lesson on detaching from the outcome in there somewhere. Zen and the art of running your first 50, or something like that. Looking back, I highly recommend this race. It’s a beautiful and challenging course, and it’s extremely well organized. It was definitely the best race I’ve ever run. A big thank you to all the amazing volunteers and all those runners who offered encouragement as they passed me. Especially all those from the November Project, who were having a great time out there. I will be back next year, and plan on making that cutoff time irrelevant. Especially since I seemed to have missed a good party at the finish that included Dean Karnazes body surfing. 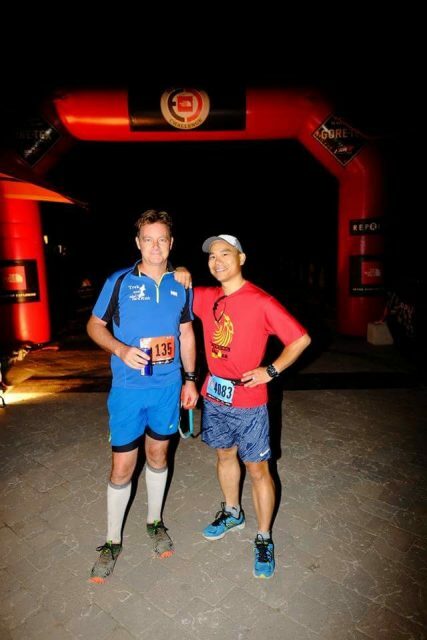 Tim Sweeney lives in Toronto and is obsessed with ultra running. He is the Canadian Editor at Trek and Run.